Recently DC Comics began a Hanna-Barbera “crossover” series and they are the strangest, weirdest things you will ever see in this lifetime. Imagine your favorite old Hanna-Barbera cartoons re-imagined as real people, not simple animated cartoons…the Flintstones drawn as an actual anatomically correct people, experiencing life as real flesh and blood human beings do, but still living in that Bedrock setting, or the Scooby Doo gang as real kids investigating paranormal events in the middle of the Apocalypse…and you get the picture. I’d been taking a pass…I actually hated what Hanna-Barbera did to animation all through the 60s, 70s and 80s, which didn’t get turned around until Who Framed Roger Rabbit appeared and reminded everyone what real hand drawn frame by frame animation looked like. Even Disney was starting to loose it. But then I saw Exit Stage Left: The Snagglepuss Chronicles, and had an abrupt change of mind. It’s actually brilliant…Snagglepuss re-imagined as a kind of famous and closeted Tennessee Williams-esq playwright, coping with the homophobic prejudices of the 1950s and 60s. Yes…they’re actually going there. And it’s not that hard at all to re-visualize that character in those terms…that pink oh so theatrical mountain lion whose tagline was Exit, stage…(right or left as need be). Weird though it is to see these characters drawn as if they were alive in our real world, and interacting with humans and it’s all taken for granted that its normal. And it is very Very weird. And yet…it works. This is the central theme of issue 4, and perhaps the entire series. 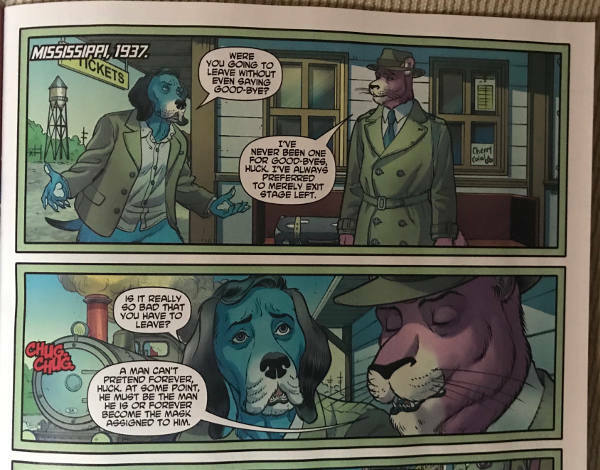 Huckleberry Hound is we discover, also gay and in the previous issues came to New York and connected with Snagglepuss again, who introduces him to the Stonewall Inn, where he meets and begins to date one of New York’s finest, a certain constable McGraw. But the Stonewall is raided…not the raid that provokes the riot this time…maybe that one comes later on…and constable McGraw is ordered to be part of the raiding party and ends up gay bashing Huck after Huck says to him “Hello again officer…” in front of McGraw’s superiors. He later breaks down in front of the Stonewall, aghast at what he’s just done. Snagglepuss wasn’t there, he was introducing his own wife to his boyfriend, because he’d grown tired of seeing himself as a coward. It’s brilliant. There’s more I haven’t touched on…the references to the Blacklist…the government agent angry that S.P. isn’t willing to cooperate with their witch hunt…the nuclear bomb engineer who when asked whether the American public should know the truth that building bomb shelters is pointless says “Oh no! It’s a democracy. The truth is the last thing you want people to have.” and… “…there is no such thing as Truth. Only usefulness”. For this I can accept the absolute weirdness of seeing the old cartoon characters drawn as if they were real and lived among us and it was all taken as normal. There was a time after all, that we thought Mutually Assured Destruction, digging bomb shelters in our back yards and leading school children in duck and cover drills was normal.